It has been a real week of reflection. I came to school on Tuesday to find that the Theatrette had been booked by the two Year 3 classes to celebrate the end of a GID unit that I had no part in planning as I have been working with four Year 7 classes this term. They were holding their culminating Share activity of a “This is your Life” show. The unit studied was British Colonisation of Australia. The students were all dressed as the character they had chosen to research – convict, free settler, aboriginal, Marine guard, colonial Governor etc. Each had prepared answers to questions about their trip to Australia on the First Fleet, their life in the early colony etc. 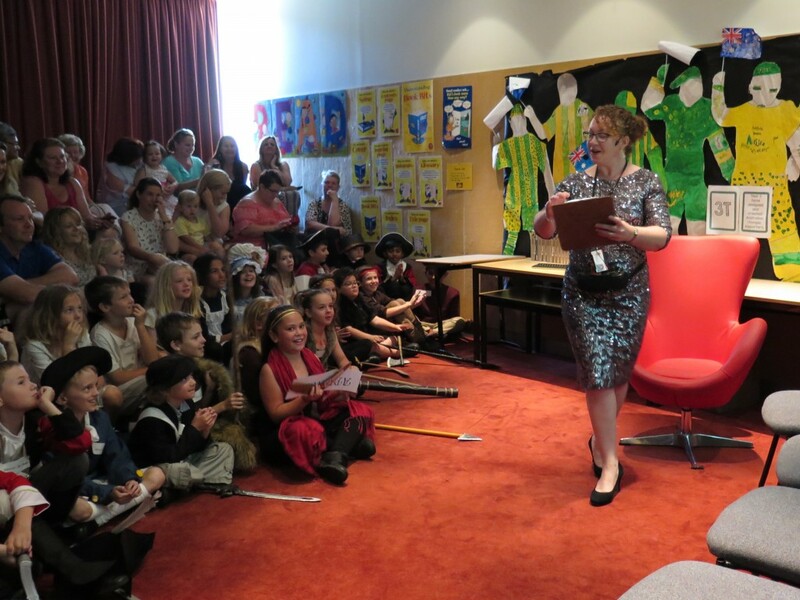 The teachers were ‘dressed to the nines’ as the host and the room was crowded with parents and grandparents. I first collaborated in this unit of work in 2014 and this was a repeat with one teacher supporting another who had not used GID before. It was a fantastic morning – the children were so excited and had obviously learned a great deal! 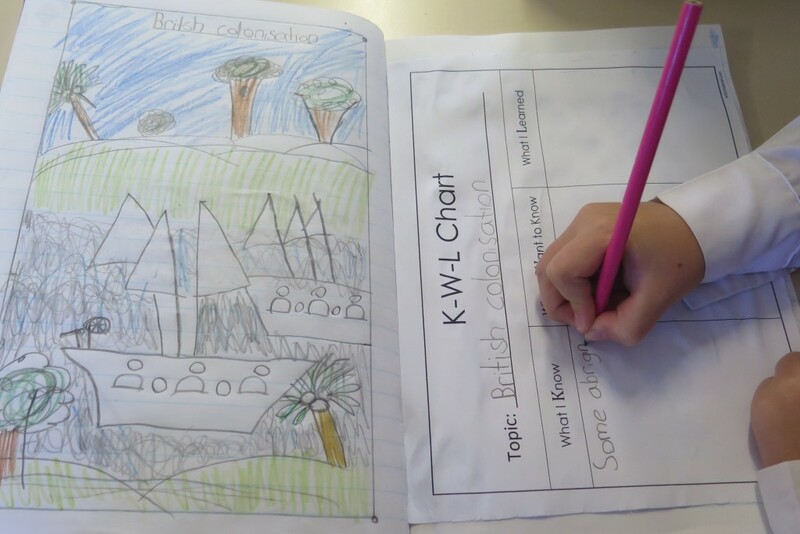 After the first few years of using Carol Kuhlthau’s original model of the Guided Inquiry process, with its nouns as steps, I was over the moon when we were introduced to the new GID process step names as verbs which made so much more sense to the younger students. Add to that the new colourful Syba Sign images to guide students through the process and it is now so much more connected for everyone. Whilst I have always, in over 40 years of teaching, tried to make learning personally relevant to my students the concept of ‘Third Space’ explains why relevancy works so well and the more we can encourage teachers to have students explore within this space the more the students will retain and build knowledge and be engaged in their learning. Guided Inquiry Design does this so well! In 2008 I began using Guided Inquiry with Year 7 and then after two years had my first experience of a Year 10 class. The difference was marked but really the outcome was similar. All students without exception were engaged in their learning and the teachers involved continued to want to repeat the process. Though the years I have gathered evidence, obtained permissions for publication and used this to promote the GID practice in our Australian schools. Syba Signs provided our first professional learning conferences on Guided Inquiry and continues to supply Australian school libraries with signage and books. Differentiate learning tasks, set up and share in inquiry circles, deliver scaffolds, share resource list links (eg Diigo), collect and share work, share links to final products – websites, videos, assess scaffolds, links to questionnaires for action research…. and more! Thank you to everyone who has shared and contributed to my learning and I hope, through sharing freely, I have helped others in some small way too. Now, in the summer of 2016, I have a year of teacher training behind me. Ten teachers chose voluntarily to attend in service training in Guided Inquiry here in Sweden. I have re-read Guided Inquiry Design and have tried to put the teachers in the position of the students. I have tried to model, encourage and listen. We had some kind of a crisis at Explore – believe that most of them had the intention of start skipping class and blaming me and their fellow group members for the fact that we were not getting anywhere, neither individually nor as a group. But we hung in there and at Share and Evaluate our principal was attending – of course by coincidence, but what would we be without it? And I had “a sense of completion suited to the audience.” And also a sense of pride in the room. I am at this point invited into a number of teams, in school and at other schools. The most important aspect for me right now is that I have stayed true to my vision and my method, what suited me and that it worked for us. We don’t know if and in that case how it will spread but we feel confident that something is achieved. 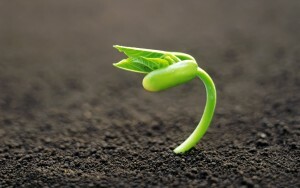 We have taken care of the seeds and some of them are definitely thriving. I have seen myself as a half. I believe I know certain things and the teachers believe they know certain things. When we meet we learn both about what we thought we knew but also about what the others thought they knew. The difficult part is to get the meeting. Me being the person that has taken every single initiative also tends to put me in the position of the one who is supposed to know. So to have the courage to back off from those expectations but keep the teachers in the conversation is an advanced assignment. So far I have been the one telling stories. Like the one you’ve just read. The story of me and my journey with ISP/GI, the story of third space, the story of student voices from evaluations and now the voices of teachers’ evaluations from their journey this year. I would like to move on from there. And I believe I am. A couple of colleagues from another school were so inspired by my stories that they applied for and will attend the summer school at Rutgers this summer, my much younger colleague here at my school is involved in all the digital tools projects that exist here, a couple of teachers are in charge of a full day programme at an in service training for teachers in our region and another teacher is including GID material in an educational website that she’s creating for the Swedish National Board of Education. There will be a chapter about us in the book about the varieties of inquiry across the globe by Lee Fitzgerald coming… sooner or later. I wish you all the strength, imagination and persistence to keep on giving young people the best education in the world. Instructions for this blog are to post three entries during the week. I guess in addition to being risk adverse I am also a rule breaker. While preparing for this week, I was totally unable to put my thoughts into three entries. So, if this has been too much, my apologies. My interest in this topic is robust. The next week of the adventure was spent in the library, five days, one period a day spread across the four areas of study. Each classroom teacher gave up one day of instruction with the English teacher giving two. The students spent that period in the library using print and electronic sources to gather information, take notes, and record citation information. The library space is flexible with moveable tables, quiet study carrels for individual work and open access to myself for one-on-one discussion. 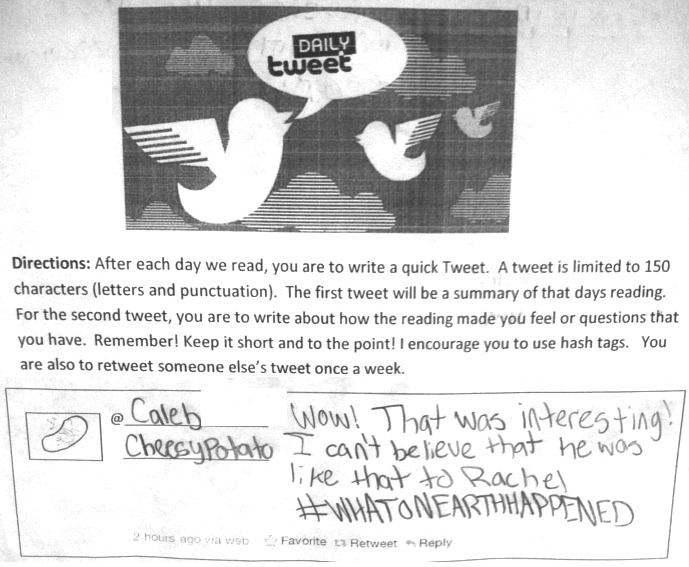 This provided independent time to search for, select, and use information with guidance from myself and the classroom teacher. At the end of this week, we provided opportunities during study hall and free periods for students to seek help from the librarian for source help, the English teacher for writing and citing help, and the topic content teachers for content help. In addition, as the time progressed, students worked on rough drafts with parenthetical citations and practiced peer editing during English classes. The total project covered six weeks. How did your expectations of the process and tasks match your actual experience? Which type of sources were not useful to you during your research? Which experiences with the librarian were most beneficial to your experience with this project? 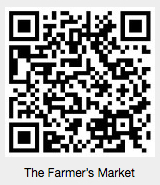 Please give your thoughts on eBook sources(s). What questions should the English teacher and the librarian have addressed earlier in the process? The responses are as varied as the students yet there did not seem to be any extremes. Many students felt that the experience was much less difficult than they had expected, many commented positively on the guidance they received from both instructors including the ability to come to us during their free time for one-on-one help, and the variety of sources they found most useful covered the entire spectrum. The final question produced some very insightful comments which we will take into this year’s project. As we instructors debriefed while mulling over these comments, we noted that we observed great improvement in the quality of the work done throughout the process and as a result great improvement in the quality of the final product. One conclusion we immediately found was that waiting until January to start instruction in the process is too late in the year so we have made changes to begin this year with a smaller inquiry project in the World Geography course. Students began this in August with instruction on ISP and different types of resources and their uses. We also use the T.R.A.I.L.S (Tool for Real-Time Assessment of Information Literacy Skills) tool from Kent State University Libraries to assess the success of our teaching and projects. Improvements within the freshman class over the school year were an average of 8.2% over the five categories with the largest gains in the areas of Develop Topic and Evaluate Sources and Information. These are the largest gains we have seen since we began using this tool. We believe that the improvements we made to this project and the adding of smaller projects to practice the process during the school year resulted in these gains. As a result of this collaborative project and the success we all feel is evident, I brought this information to the Middle School and Lower School librarians. After showing them what we had done, how it came to fruition, and the positive results, together we came to the realization that using Guided Inquiry at every grade level was the perfect next step in the evolution of our curriculum. I ordered copies of all the professional books and compiled a collection of professional articles for each librarian and we spent the summer reading and thinking. Our department goal is to re envision existing research projects at all grade levels with the goal of moving them to Guided Inquiry and change one or more during this school year. A big job which we feel will reap real rewards for our students, teachers, and libraries. My apologies for loading three posts at once, I am travelling to NZ tomorrow for the IBBY Conference. (International Board of Books for Young People) so I need to finish my contribution to the blog. Overall, Guided Inquiry provides a great framework for inquiry. In Australia we have recently overhauled many of our syllabus documents, particularly History, Geography and Science. Each of these syllabus documents now contains the language of inquiry. It has been a great step in the right direction. As we begin our fifth year of using the GID model for student research and inquiry in BCPS, we have some goals for expanding and enhancing its use, and some challenges to address. Our district has in the last few years embarked on a digital learning model supports transition and ongoing 1:1 device rollout called S.T.A.T. (Students and Teachers Accessing Tomorrow). The GID model we use to design our Online Research Models (ORMs) for extended, in-depth inquiry supports the S.T.A.T. initiative’s focus on critical and analytic thinking and personalized learning in a blended, learner-centered environment. We anticipated that there would be more opportunities to incorporate our Online Research Models into curriculum across grade levels and content areas in conjunction with S.T.A.T. Instead, in recent years there have been fewer requests for ORMs from content curriculum offices/writers and an increased demand for brief, focused research tasks. (BCPS adopted Dr. Jamie McKenzie’s Slam Dunk digital lesson as our model for brief, focused inquiry in 2004; these are labeled “Slam Dunk” on our Research Model index). One reason for this may be the PARCC assessment, and a tendency to target only those research skills that will be assessed on the standardized test. We know that students need to develop a broader range of skills aligned to the AASL Standards for the 21st Century Learners and other 21st century learning standards—not only for “college and career readiness” but for life. Another reason is time—the Slam Dunk lessons take only a couple of class periods to implement compared to extended research tasks and the information literacy skills instruction they include. We often hear that there is not enough time to engage students in an ORM/guided inquiry and still “get through all of the curriculum.” Our Library Media team believes that multiple content curriculum objectives can be addressed in an Online Research Model structured according to GID. We need to convince our curriculum partners that we can design ORMs to achieve this, and that students need multiple opportunities each school year to engage in extended, in-depth inquiry and to learn and develop the associated skills. In our new/revised ORMs, we hope to provide students with more opportunities to generate their own questions and engage in reflection during the process, and to increase student choice of topic, process, and product. While most of our ORMs include some student choice at various steps in the inquiry process, in some cases student choice has been limited by the demands of the curriculum. For example, our ORMs have always included an “essential question” aligned to content curriculum. This is not necessarily the same as an “inquiry question,” which might be more focused and could be developed by students themselves as part of the process. Students also need more opportunities to locate information sources on their own (both in our licensed digital content and on the open Web), and to develop skills like identifying keywords, building search queries, and evaluating search results. There has been a tendency to provide lots of targeted information sources in our ORMs, in an effort to “save time” by steering students directly to sources that include information required to address the research task. This is a missed opportunity for students to develop some essential information literacy skills. Another goal we have is to fine-tune the skill-building resources and tools in our Grades 5-8 Research Guide. We would like to link directly to skill-builders and tools aligned to specific GID phases in our Online Research Models. For example, a student engaged in an ORM who needs help with note-taking/paraphrasing during the Gather phase would find a direct link to a tutorial from the Guide at the point of need, or the teacher/librarian could readily utilize these resources with students as they identify “zones of intervention” during the research process. 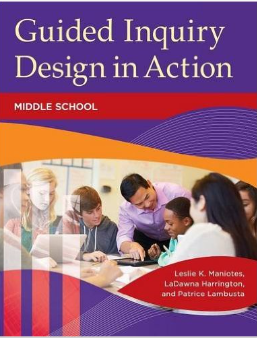 In closing, I want to mention that I purchased the new Guided Inquiry in Action: Middle School book earlier this year. I am so excited to incorporate ideas and insights from this book as we revise some of our existing middle school Online Research Models and design new ORMs this summer. I really appreciate having had this opportunity to share some of Baltimore County’s GID journey with you here (thanks for asking me Leslie!) Any questions or feedback about our work from fellow educators using GID is most welcome! After the Mesopotamia project, we felt that it was important to reflect upon what we learned from this process. 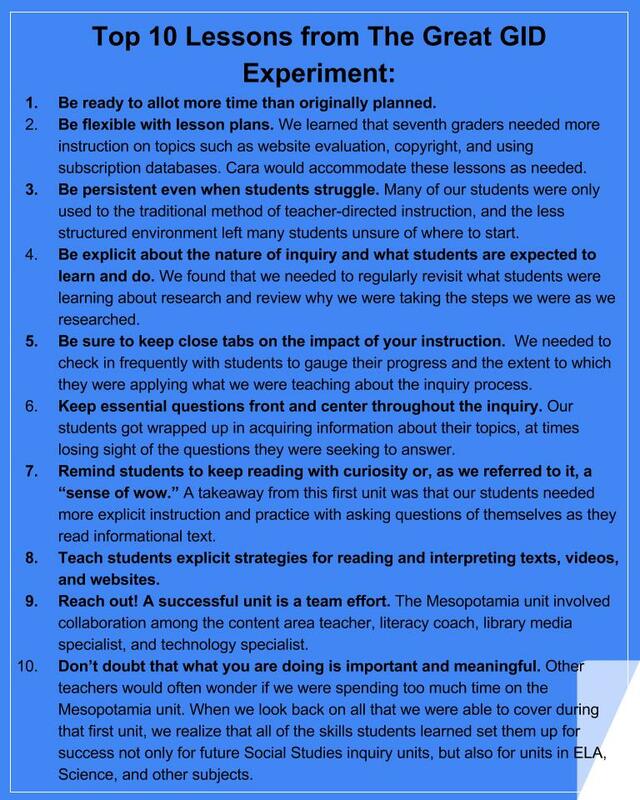 While we have learned much more than what we can possibly list, here are the top ten lessons learned from some guided inquiry newbies. Did what we learn change our approach in future units? ABSOLUTELY! Even after completing additional units on fracking and the Native American mascot controversy, we continued to learn more about what worked and what didn’t. Above all, we have learned that there is still so much more to know. That is why we are especially excited to be attending the CiSSL Summer Institute at Rutgers this summer. We can’t wait to learn more from Leslie and her team of experts on how we can improve this process and better help our students succeed. Thanks to those of you who have followed our journey. We hope that we can continue to share our progress after learning more this summer. Previously, I shared the beginning stages of our GID project, Challenge and Change. At this point, students are now in the process of gathering information about their topic, hence the GATHER title for this stage. This is the part where I as the librarian am the most valuable resource to our students. As a part of this process, I am also able to meet the demands of my own curriculum though the implementation of mini-lessons. Each mini-lesson addresses things like database use, keyword searching, Google searching, citing sources and even basic note taking. After gathering, students begin the steps to determine how they want to share out their information in the CREATE step. We provide the premise to students that they will be presenting an award to the person they selected for their research. They are to come up with the name of the award and their research will support the reasoning behind it. What was the BEST part of the project for you? As you see in the graphic below of the process, it may seem odd that the steps are not in an evenly spaced track from bottom to top, or even a nice neat row, but it is quite intentional (based on the research of Carol Kuhlthau) and accurate when you look at how students respond to the process as a whole. You can think of the placement of each block as the excitement level of your class as you being the process. Personally, my students start off apprehensive, get more excited as we begin the immerse stage and then get overwhelmed a bit when they start to explore. However, once they narrow their topic their motivation and excitement increases and grows throughout the completion of the assignment. As the subtitle of this site specifies, this truly is a way of instructing that will change how you teach. I am so happy to have been able to participate in blogging this week and to have been exposed to the GID process with instruction and guidance from Carol Kuhlthau, Leslie Maniotes and Ann Caspari. Each of the research projects which I now develop with teachers, all mirror the process above. I know that changing how teachers teach a project can be difficult to influence, however my strategy has been to slowly incorporate elements, piece by piece each year. As teachers see the motivation and excitement of their students grow, as well as the quality of their final product improve, they are more willing to let me slide in a new step. It is not just the steps which are so valuable, it is also the small strategies and tools which are present in the process which also work to empower students and provide them with the opportunity to reflect on their own thinking and learning, which is truly a life skill. Good luck to each of you as you being your own journey of discovery with Guided Inquiry Design!